In this course residents learn the fundamental concepts of health promotion and disease prevention. Emphasis is on assessment, health promotion, and risk reduction/ prevention related to oral health. The American Academy of Pediatric Dentistry and the American Association of Pediatrics currently recommend that children receive their first dental evaluation within the first year of life. 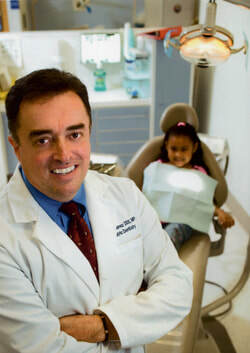 In general, there is an increasing trend toward providing dental care to children before the age of three. The reasons for early dental intervention with pregnant women, infants and parents are to determine the risk status based on the information from the parents and to perform a screening risk assessment and examination of infants’ mouths. This early care provides an opportunity to educate and inform parents about their children’s oral health. Anticipatory guidance/counseling for children’s dental health is an important part of preventive care, and may be the most effective way to prevent problems (such as early childhood caries (ECC)) that traditional infectious-disease models have failed to address. Learn the fundamental concepts of oral health promotion and disease prevention at the individual and at the community level. Describe access to care issues and develop strategies for oral disease prevention at the individual and at the community level. Understand why pregnancy provides a unique opportunity to provide oral health interventions for women and their infants. Realize the impact of maternal oral health on the longer-term oral disease status in families. Know the background and clinical evidence in support of perinatal and infant oral care. Be able to perform a caries risk assessment through the use of the CAMBRA tool for 0-5 and clinical exam results in a private practice or in a community based clinical environment. Identify the dental products available for patient interventions and develop a treatment care path to manage dental caries for any patient based upon CAMBRA risk assessment protocols. Understand the benefits and challenges in creating buy-in from dental team members, and the influence of third party payers on patient acceptance. Learn to examine, diagnose, and treat very young children using an Infant Oral Care model. Effectively utilize Motivational Interviewing skills to elicit positive behavior change. Be able to offer dental practitioners information on a dental practice model in working with the youngest population of pediatric patients and to gain more in depth pediatric dental experience.